Depth of field focuses our attention in a photograph. Read this and focus on how to fake it digitally. Continuing on from my recent post on simulating bokeh with Metal Performance Shaders, I thought it would be interesting to create a filter similar to Core Image's built-in Masked Variable Blur but applying bokeh intensity rather than blur based on the luminance of a second image. 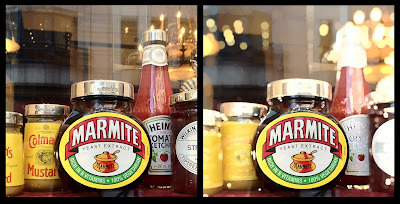 If you're wondering about the photograph: yes, we do have a shop in London that sells sterling silver lids for your mustard, Marmite, and other condiment jars. To produce these filters, I had to write my own dilate operator in Core Image Kernel Language. 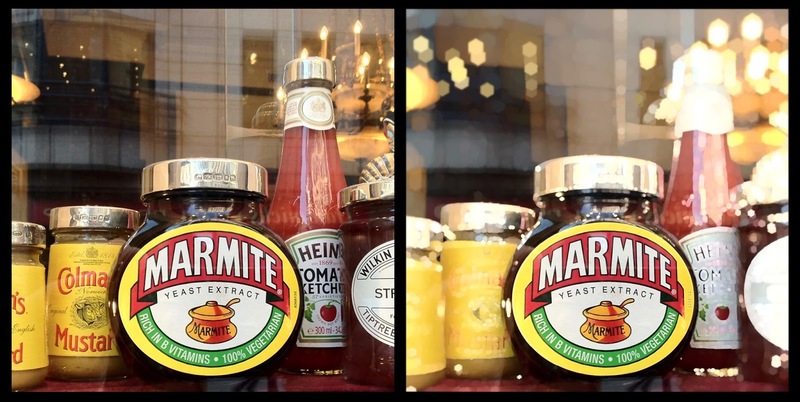 The approach is very similar to a masked variable box blur I wrote for my book, Core Image for Swift. In a nutshell, my kernel iterates over a pixel's neighbours. While a box blur averages out the values of those neighbouring pixels, a dilate simply returns the brightest pixel. The great thing about writing my own dilate is that I can code in a formula for the probe rather than passing in an array. That formula is based on the luminance of the bokeh mask image - allowing for a variable bokeh intensity at each pixel. With the clever use of a mask, these filters are excellent for simulating depth-of-field or tilt shift with a more lens-like look that a simple Gaussian blur. Both of these filters have been added to Filterpedia. I've also added a radial gradient image to Filterpedia which is a great way to illustrate the effect of these filters. If you'd like to learn more about Core Image, may I recommend my book, Core Image for Swift. Core Image for Swift is available from both Apple's iBooks Store or, as a PDF, from Gumroad. IMHO, the iBooks version is better, especially as it contains video assets which the PDF version doesn't.